It has been known that ‘Dirty Eyed Girls’ parody done by 2PM TaecYeon, ChanSung, WooYoung and 2AM JoKwon and Im SeulOng has been mistaken as a homosexual video in Netherlands. The group did the parody of Brown Eyed Girls ‘Abracadabra’ for Mnet Wild Bunny, and was said to be one comical MV enjoyed by fans. But recently, the video was mistaken as a Chinese homosexual video after it was uploaded on a Dutch video site DePers on 4th January, and the title to the video was ‘Taboo in China’. 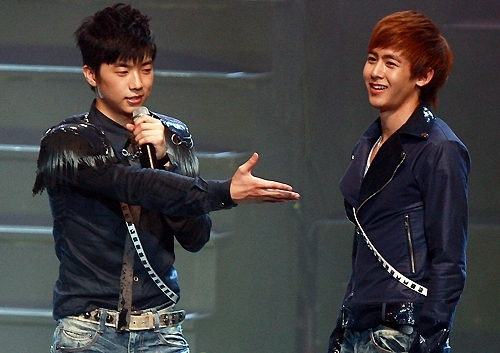 Park JinYoung has stated that out of all the members of group 2PM, WooYoung is the member he anticipates the most. SNSD Tiffany and 2PM WooYoung’s ‘love line’? Fancams, fan-taken photos of 2PM WooYoung and So Nyeo Shi Dae Tiffany during 2009 MBC Gayo Daejun on 31st December have been hot interests amongst netizens. The 2 idol members have seem very close to each other, and netizens think they spot another celebrity ‘love line’. 2PM members’ desired CF partners and WooYoung’s little episode with Kim TaeHee revealed! [Combined 2 articles from TVDaily] 2PM WooYoung reveals an episode with actress Kim TaeHee when they were filming for a CF together. He revealed smiling, “I said ‘I shall call you noona’ and she had very readily accepted it. But after that, we did not have any scene together” showing his reluctance. The violent behaviour of 2PM WooYoung fans causing WooYoung to bleed on his face and arms shocked many. 2PM performed in a NB club in Seoul GangNam InGeun during the early hours of Christmas day on 25th December. With the news about their performance, fans have swamped the venus causing confusion and messy situation at the club. And the problem happened when WooYoung was going up the stage, and fans who were trying to touch his face and arms, and hurt him with their long finger nails leaving scratches and blood stains on his face and arms. 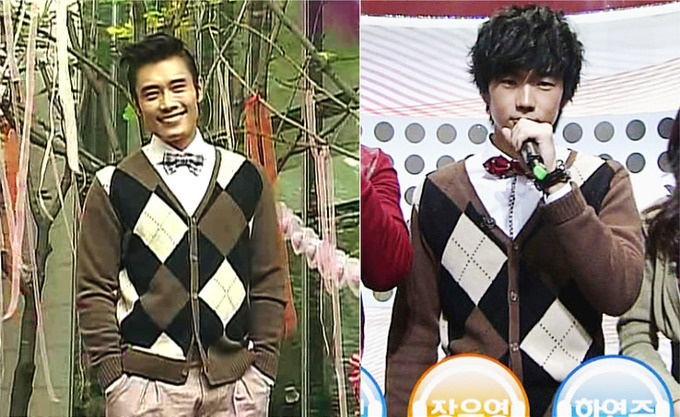 Lee ByungHun of drama ‘IRIS’ and 2PM WooYoung were seen wearing the same knitted cardigan. The photos comparing the 2 in the same cardigan was posted up on an internet discussion board. There were netizens who commented on the cardigan on Lee ByungHun, who has shown his good physical build through his latest drama ‘IRIS’, “He’s Lee ByungHun after all”. And in the photo, he can be seen with his trademark smile, and his whole image more matured looking as compared to 2PM WooYoung.